Hi, I’m Desi Mandarini. I am a certified translator and conference interpreter, and my language combination is English – Indonesian. I help companies and individuals with their needs for high-quality, accurate English – Indonesian translation and interpretation services. I provide solution to their problems with translation and localization projects, and help conferences and events run smoothly by delivering interpretation service for participants from English to Indonesian and vice versa. 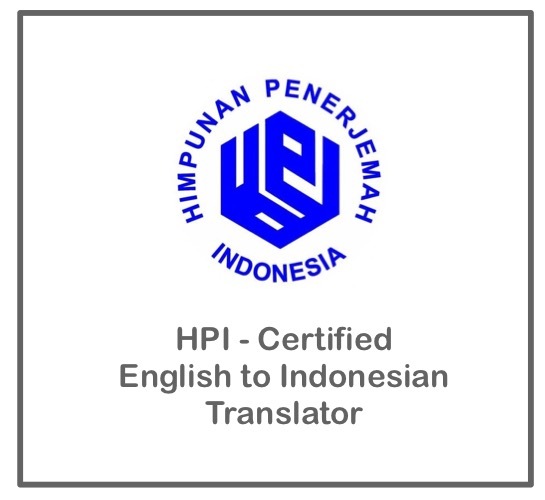 I am an HPI-certified translator for English to Indonesian language combination and a conference interpreter. I’ve worked with numerous local and global clients to translate, proofread and edit their documents in Indonesian and localize websites to assist them in penetrating their target markets in Indonesia. I uphold three professional values in serving my clients: accuracy, excellence, and reliability. I respond to my clients’ inquiries in a timely manner and always make sure I deliver high-quality results. Additionally, I believe that high-quality work will contribute to trusty, long-term professional relationships. If you are a freelancer and looking for some useful freelancing and productivity tips, listen and subscribe to my podcast “Being A Translator: A Podcast by Desi Mandarini”, where I talk about my experience as a freelance linguist and share tips on productivity and freelancing. (The podcast is in Indonesian). If you are a freelance linguist, check my free resources and productivity templates to download here. Oh, you still want more information about freelancing and how to stay productive every day, every time? You can join my mailing list to get my newsletter, delivered straight to your inbox once a month and every Monday. Are you here because you need a professional, experienced linguist to help you with English – Indonesian translation and interpretation? Check my language services here and how to book my services here. I'm a professional linguist by profession. I live in Bali, Indonesia. Books, music, and movies are my best friends.